You can literally make almost infinite types of salads. Every culture uses the local ingredients to come up with unique salad preparations that are not only healthy but also go well with the main course. Today, I'm going to make a simple yet extremely colorful and tasty salad that can be prepared within minutes. The primary ingredient in this salad is peach, but you can replace it with different types of fruits. This salad tastes best when served after an hour of refrigeration. You can also serve it at normal temperature provided it is served fresh. You can also experiment with it a bit by adding multiple fruits or a combination of fruits and vegetables to give it a different touch altogether. So without wasting more time, let's get on with the work and make this salad. Make this fruity, delicious and cheesy salad platter made from mashed cottage cheese and fresh peach slices to give you a cooling sensation in the summer season. Cut and slice all the peaches in 2" pieces. Wash them well and keep aside. Add milk to the cottage cheese and whip it well. Cut lettuce leaves in big pieces and mix well with peaches. Add salt and sugar and toss the salad in a big bowl. Arrange on a big flat plate. 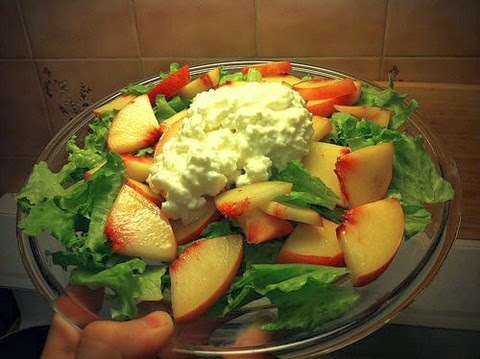 Top with generous amount of whipped cottage cheese. Refrigerate for an hour and serve with your favorite dish.